How many times do we need to pull out a particular category of numbers from a list and add them up. 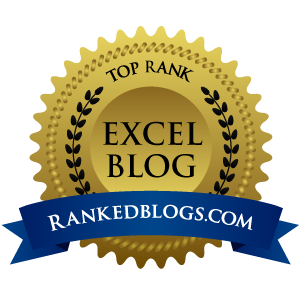 Well, you might not be aware that Excel has a pretty simple function designed to do just that. The SUMIF function can be used to pull out departmental information from a trial balance, sales information from a transaction list for a particular salesman, department or division (as in the example we will use), or for any other situation where you have a list and need to selectively sum a subset of that list based on criteria. It is actually a pretty simple function when you know how it works, but is very powerful in the types of situations outlined above. This is a simplified situation where we have a list of sales transactions in columns A to C (maybe imported from your accounting software) and want to report total Retail and total Wholesale sales. We will use SUMIF to return the values in cells F3 and F4. where CriteriaRange and SumRange are one column wide and the same number of rows as each other in height. CriteriaRange is used for the column that includes that data that you wish to filter your sum by (in our example, C2:17). Criteria identifies which item in the criteria range column you want to sum (in our example, "Retail" or "Wholsale" for cells F3 and F4 respectively). SumRange is used for the column that holds the data you actually want to add up (in our example, B2:B17). This argument is optional and if not entered CriteriaRange is used. The criteria does not need to be a simple matching as in our example. A condition such as ">0" could be used to sum only positive values (this is an example where you might not enter the separate SumRange as the criteria is applied to the data being summed. Have a play with it and see what you can use it for. SUMIF is great if you know the exact format of the output that you want and you require a fixed layout. 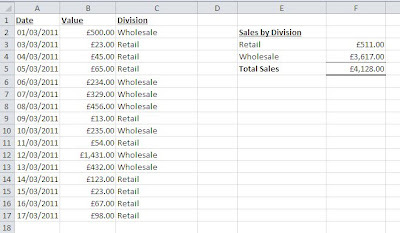 If you want to summarise all of the data in your list dynamically, a pivot table might be more what you need. If you want this kind of help on hand when you need it, have a look at my Excel Advice by Email service which provides email advice when you get stuck for a small subscription.